Kevin Johnbrow, from Spokane's wastewater treatment plant, spreads biosolids on a farm near Reardan last week. As cold wind whips the air on a recent September morning, bringing the first taste of fall to an empty wheat field near Reardan, workers spend the morning loading the soil with about 75 wet tons of a material that will help feed next year's crop. That material they're spreading? Well, it's kind of your poop. And the city of Spokane alone creates enough of it to cover 5 to 7 acres every single day. Technically, it's not just human waste, but treated sewage sludge from homes and industrial users, processed at the city's wastewater treatment plant before being tested to meet federal and state regulations so it can be spread on farmland. The stuff that meets the requirements is commonly called "biosolids." Since at least the 1980s, local farmers such as the Carstens, who tend this field about 30 minutes west of Spokane, have been using biosolids to help nourish dryland crops, with great results. "It's adding organic matter and macro- and micronutrients we wouldn't normally apply," says Kurt Carstens, whose family has stewarded the land since homesteading in the 1860s. "[Crops] respond to it like it's fertilizer." The Carstens were among the first to get biosolids from Spokane, which rotates between a list of farmers and properties, as crews have to distribute biosolids every day of the year. In winter, workers create berms and pile it on farms so the solids can be spread once the ground thaws. Over the years, the quality of the city's biosolids has improved as the treatment process has gotten better, Carstens says. "It's funny, when we first started, you might get squash or tomato or something you hadn't planted," Carstens says. "We haven't seen that in years." But even though biosolids have been used successfully on aboveground crops in Eastern Washington for years, a recent request to spread the material on a farm north of Davenport has been met with strong resistance from neighbors, who question whether regulations created more than 20 years ago have kept pace with research into potentially harmful contaminants that might be found in biosolids. More than a year ago, Fire Mountain Farms, based in Western Washington, started the process of renewing its permit with the state Department of Ecology to spread biosolids on properties around the state. One property the company hoped to add to its list this time was Rosman Farms in Lincoln County. Farmer Garry Rosman says he got interested in biosolids maybe a decade ago, but didn't get serious about it until a few years ago, when Fire Mountain Farms, which was clearing a nearby town's treatment lagoon, asked if he'd be interested in permitting his land for biosolids. Fire Mountain Farms cleans out treatment lagoons for smaller towns and cities, and typically tries to apply those biosolids to sites as close as possible, says president and CEO Robert Thode. For small towns, those sites may only have to be cleaned out once every 25 years or so, he says. It takes a while to go through the permitting process, so it's common for Fire Mountain to permit a site and then find a source of biosolids nearby, Thode says. There isn't a set source determined yet for Rosman's site, if it gets permitted. When neighbors in Mill Canyon found out about the plan for Rosman Farms, they were concerned about whether the biosolids might wind up in their water, or come down the hill with wind or flooding. State rules require buffer zones to keep biosolids away from surface water and steep slopes to prevent contamination. While treatment facilities are required to test biosolids for certain metals, and treat them to reduce the risk of disease, they aren't required to test for other potentially harmful materials such as chemicals found in medications or household products, which concerns the neighbors, who formed the group "Protect Mill Canyon Watershed." Among their ranks are organic gardeners and farmers, including current and former residents of the intentional community of Tolstoy Farm — or "granola types," says Chrys Ostrander, who lived in the community for about 20 years before moving to a nearby town. He's helping spearhead the efforts to protect the watershed. The intentional community's business, Tolstoy Farms, supplies produce to Spokane restaurants and helped start the Saturday farmers' market, and while the farms' source of water is upstream from the proposed application site, they support their concerned neighbors, such as Morton Alexander, who owns a private, organic orchard in the canyon. In addition to opposing the application near their homes, the group is calling on the Department of Ecology to halt all biosolids permits in the state until further research is completed. That effort is supported by the local chapter of the Sierra Club, the Columbia Institute for Water Policy, and concerned environmental groups and nonprofits. "They only look at a tiny fraction of what is in biosolids, and it is completely unacceptable," Ostrander says. While Ostrander says he appreciates that some parts of the treatment process have gotten better, he feels that relevant research showing that antibiotics and chemical contaminants make their way into biosolids is being ignored. "The thing that hasn't changed is they haven't added any other substances under their list of what they're concerned about," Ostrander says. "They've just stuck with these same metals for years and years and years." 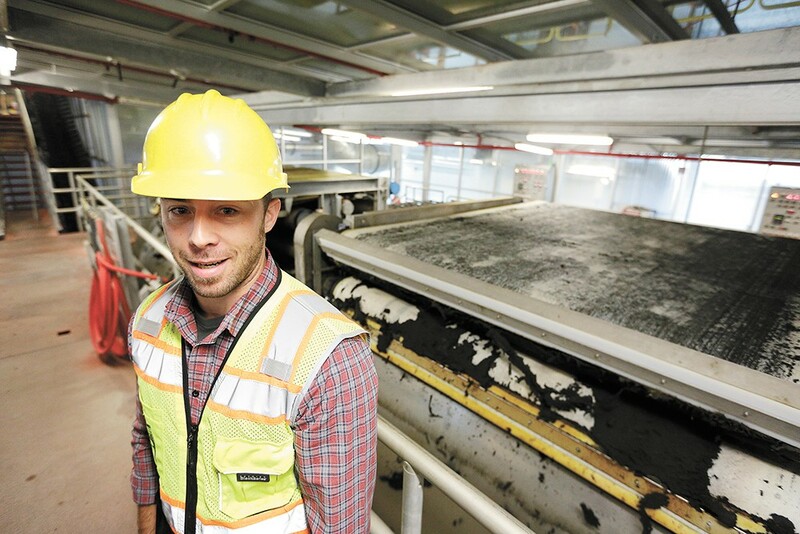 Kyle Arrington, a chemist with Spokane Wastewater Management, shows the press that removes excess water from biosolids. Under state and federal rules, biosolids are tested for nine metals. Washington's rules are a little more stringent on the amounts of those metals allowed, but in general, mirror the federal rule, says Wayne Krafft, section manager for Ecology's Eastern Region Waste 2 Resources program. While Ecology's role is simply to enforce the regulations put in place by the state legislature, Krafft says, the regulations were also created with an eye on what is worth testing for to protect people and the environment. "Sure, we could have them test for absolutely everything, and find out over and over again the levels we find are below what would cause any sort of risk," Krafft says. "While you will find pretty much any chemical in biosolids, the concentration is so low that it doesn't pose any threat to human health by any sort of potential exposure pathway." Those thoughts were echoed by Andy Bary, a senior scientific assistant with Washington State University Puyallup, who has researched biosolids for more than 25 years. In the cases he's studied, Bary says, "the use of biosolids improves soil quality, improves crop production and is not a risk." In general, biosolids tend to be more regulated than other fertilizers, Bary says. They are applied at calculated rates to match the nutrient needs of the crop they are being applied to, which is meant to prevent excess nitrogen from leaching into water sources. "The amount of research that's been done on biosolids is huge," Bary says. 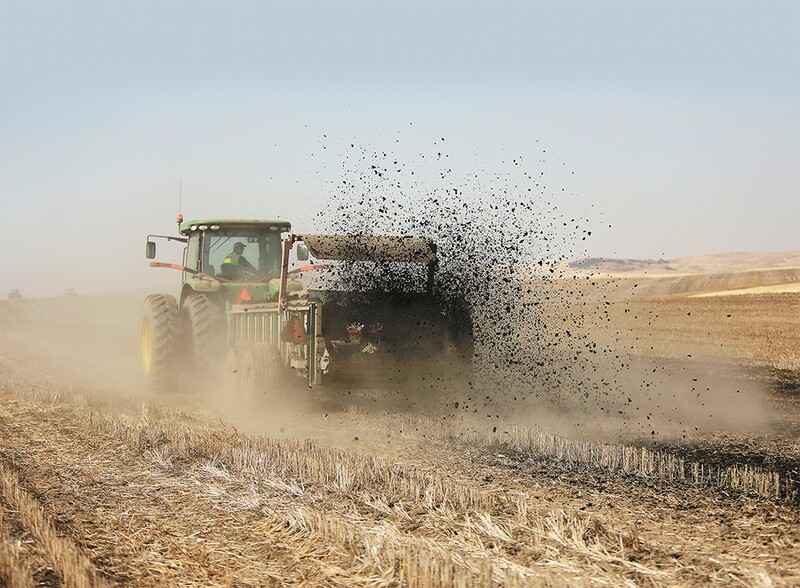 "There's probably been more research on biosolids application than on dairy manure." Bary, who advises groups around the country on biosolids use, says that Washington is known around the U.S. for managing biosolids well. A lot of new biosolids research is focusing on substances such as pharmaceuticals, antibiotics, flame retardants and other chemicals that are more of a concern now, Bary says. However, in the research that he's seen, the risk of exposure from biosolids is significantly lower than exposure from day-to-day materials. Take, for instance, flame retardants. "Are you sitting on a foam chair?" Bary asks. "Your exposure to that is greater sitting on that than it would be from biosolids application." Or look at over-the-counter medicines. "Let's say you are a gardener," Bary says. "It's going to take greater than 50,000 years to be exposed by gardening to get to one tablet of ibuprofen. Your exposure is extremely, extremely low." But Ostrander points to a 2010 study from Canada that found the presence of dozens of antibiotics like penicillin, and chemical compounds such as Bisphenol A (BPA), in biosolids. That study recommended further research into possible risks for the substances they found most, such as BPA. He also points to a long-term soil study from Scotland that found some bacteria that help plants absorb nutrients had been killed off on land where biosolids had been applied for a long time. "I understand that there are some studies out there that indicate biosolids are safe. Most of those ignore large slots of categories of chemicals and other pollutant contaminants," Ostrander says. "Small amounts of 100 different chemicals is not necessarily small anymore. They don't talk about how these might interact in the environment." Rosman says he's been friends with his neighbors for 30 years, and doesn't want any of this to come between them, but he does find some of their concerns a little hypocritical, considering that some of his neighbors use outhouses on their land. Ecology has yet to issue its decision on the Rosman Farms application, but could do so in the next few weeks. If they approve it, Protect Mill Canyon Watershed says they'll appeal the decision. Rosman says he hopes the group understands that if the application is approved, he'd only get biosolids sporadically, when a town nearby needs its treatment lagoon cleaned out. Even though biosolids could save him $25,000 in fertilizer costs each year he gets them, he says that if the permit isn't ultimately approved, it won't change the way he farms one bit.